This post is based on a viewer request, which is being filled due to a donation to the Secular Student Alliance via my campaign during Secular Students Week (June 10-17, 2015). Thanks to all for your contributions! Today’s movie is Manic, an intense and realistic story about a group of young people being treated for a variety of mental illnesses. Manic was written Michael Bacall (21 Jump Street, 22 Jump Street, Scott Pilgrim vs. The World) and Blayne Weaver (Honey 2, Weather Girl), who both also appear in the film. The director for the film was Jordan Melamed, whose only other directing credit is a 2012 documentary called Futures Past. However, he also wrote the screenplay for Twelve, a 2010 movie by Joel Schumacher which he also served as producer on. The cast of Manic includes Don Cheadle (Swordfish, Hotel Rwanda, Iron Man 2), Joseph Gordon-Levitt (Brick, Looper, Inception), Zooey Deschanel (500 Days of Summer, The Happening), Elden Henson (Daredevil, The Mighty Ducks), Cody Lightning (Smoke Signals, Brick), and co-writer Michael Bacall (Django Unchained). The story of Manic centers around a number of patients in the psych ward of a hospital, who are all in the process of dealing with a variety of mental illnesses. As the movie goes along, some of the patients progress, others regress, and a handful of friendships and bonds are formed. 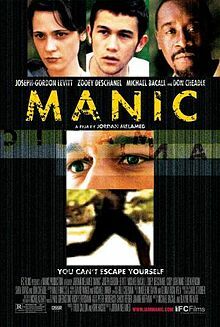 Manic features a handful of teenagers in the background who had actually been treated in institutions for mental illnesses, which adds to the realism of the setting and the tone of the movie. Zooey Deschanel and Joseph Gordon-Levitt once again acted alongside each other years later in 500 Days of Summer, an acclaimed indie romantic comedy that immensely popularized both actors. 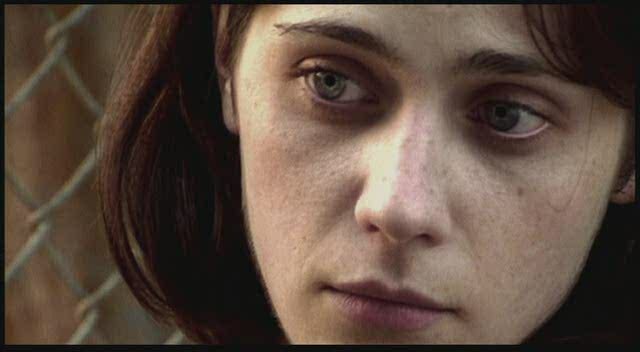 Manic notably premiered at the 2001 Sundance Film Festival, one of the most revered showcases of independent films in the United States. The reception to Manic was generally positive. On the Rotten Tomatoes review aggregator, Manic currently holds scores of 67% (critics) and a 79% (audience), alongside an IMDb rating of 7.4. Manic reportedly had a budget of $1.5 million, but it was only able to make less than $70,000 in a limited theatrical run. Melamed and Hay made an unfortunate decision to use the hand-held style that specializes in gratuitous camera movement, just to remind us it’s all happening right now. 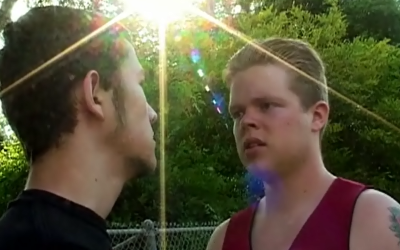 There are swish-pans from one character to another, an aggressive POV style, and so much camera movement that we’re forced to the conclusion that it’s a deliberate choice. A little subtle hand-held movement creates a feeling of actuality; too much is an affectation…the camera style [of Manic} made me work hard to see it at all. Manic serves as a fantastic showcase of acting abilities if nothing else, particularly from Zooey Deschanel and Joseph Gordon-Levitt. 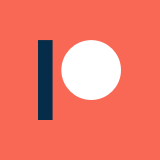 While both actors have found their footing in Hollywood now, it is a shame to see Deschanel pigeon-holed into her “Manic Pixie Dream Girl” persona, which she can’t seem to escape. Manic makes it clear that she can do much more if given the opportunity. Similarly, Joseph Gordon-Levitt shows a potential for violence and simmering intimidation in Manic that he rarely gets to utilize in his roles today. He does use those qualities a bit in Hesher, however, which is also worth checking out. Cheadle also gets to showcase himself a bit, but his character definitely takes a back seat to the youth in the movie, and he has less of a resolution than any of the other characters in the movie. The non-traditional plot structure for Manic makes it difficult to tell as an audience member where you are in the progression of the story, and it isn’t really clear until the third act that an end is anywhere in sight. At first this bothered me a bit, but it actually fits with the Sisyphean theme of the movie really well now that I have spent some time thinking about it. Overall, this is a very emotionally heavy movie that definitely isn’t for everyone. The shooting style and pacing could also turn a lot of people off, but the performances generally make it worth checking out. I’m not usually a huge fan of hyper-realistic cinema, but I thought the use of handheld cameras was a good decision here, and it is hard for me to imagine the movie without them. If you are interested in checking this out, you need to know that this isn’t One Flew Over The Cuckoo’s Nest or I’m A Cyborg, But That’s OK. This is neither a straight conventional drama or a romantic comedy against the backdrop of an institution: it is an honestly bleak and stark look at what dealing with mental illness as a young person can be like, and it doesn’t pull any punches. If that is something you want to see, then give Manic a shot.